Owner Clive Smith is optimistic over the chances of Kauto Star completing a hat-trick of victories in the £225,000 Grade One Betfair Chase (2.15pm) at Haydock Park, highlight of the first day of the Northwest Racing Masters on Saturday, November 22. The Paul Nicholls-trained eight-year-old has made the three-mile contest his own over the past two seasons, destroying a top-quality field by 17 lengths under Ruby Walsh in 2006 en route to victory in the Cheltenham Gold Cup before returning 12 months later to record a half-length verdict for Sam Thomas over Exotic Dancer. Kauto Star went on to record a second successive victory in the King George VI Chase at Kempton in December but ended his season with two reversals, coming home seven lengths behind stablemate Denman in the totesport Cheltenham Gold Cup in March prior to going down by a neck in the Grade Two totesport Bowl at Aintree’s John Smith’s Grand National meeting in April. Smith reports Kauto Star to be in fine shape after the gelding posted a facile 11-length success on his seasonal debut in the Grade One Champion Chase at Down Royal on November 1, and is looking forward to seeing Thomas take the ride once again following Walsh’s injury at Cheltenham on Saturday. Smith commented: “I would rather Ruby was on board but Sam rode him exceptionally well in the race last year. I think he pointed out a different way of riding him and he did something different that the horse liked. He was very good on Kauto Star last year and I am sure he will be very good once again this year. “I think that we possibly shouldn’t have run him at Aintree last year because it’s a little bit soon after Cheltenham and it’s a massive meeting in its own right. The ground was quick enough and it took quite a lot out of him so soon after Cheltenham. “I was delighted with his seasonal reappearance and he ran very, very well indeed. Paul says he’s better than ever but I’ll still be watching with baited breath before and during the race. “He’s only eight so we still have plenty to look forward to with him. The only thing is that he’s a French-bred and they always say that French-bred horses don’t necessarily have some of the lifespan of other horses because they begin racing at a younger age. As well as Kauto Star, champion trainer Paul Nicholls may also run Gungadu, who out-battled his rivals with a game weight-carrying performance in a Grade Three handicap chase at Kempton in February and finished third under top-weight in a valuable handicap chase on his seasonal debut at Ascot at the start of the month. The Jonjo O’Neill-trained Exotic Dancer, a dual Grade Two winner, is set to re-oppose Kauto Star and the eight-year-old comes into the race on the back of a pleasing second in the Grade Two intercasino.co.uk Old Roan Chase at Aintree on October 26. Nigel Twiston-Davies could be represented by Grade One scorer Ollie Magern, who may make his third appearance in the Betfair Chase having finished seventh in the inaugural running in 2005 and fourth in 2006. John Smith’s Grand National sixth Cloudy Lane, Grade One victor Tamarinbleu and dual-Listed winner Snoopy Loopy complete the seven-strong entry. The entire seven-race card at Haydock Park is sponsored by Betfair and also features the three-mile £100,000 Betfair “Fixed Brush” Handicap Hurdle (1.40pm), which has attracted 29 entries including Grade One winner Souffleur, 2006 Royal & SunAlliance Chase victor Star De Mohaison, Welsh National and Red Square Vodka Gold Cup hero Miko De Beauchene and three-time Grade Two scorer Fair Along. 2-5 Kauto Star, 9-2 Exotic Dancer, 21-1 Tamarinbleu, 25-1 Ollie Magern, 33-1 Gungadu, Cloudy Lane, 69-1 Snoopy Loopy. Betfair spokesman Tony Calvin commented: “Having seen Kauto Star win with contemptuous ease on his reappearance at Down Royal, racing with his old verve and enthusiasm, it is easy to understand why plenty of trainers declined the offer to take him on at Haydock Park on Saturday. “But, while Kauto may be a 2-5 chance to win the Betfair Chase, which is now worth £225,000, there is little doubt this is a step up from Ireland in terms of the class of opposition. “Let us not forget that he only just mastered Exotic Dancer by half a length in this race last season and the five other horses in the race are seriously classy performers in their own right. “I feel very sorry for Exotic Dancer; in many a previous year he would have been the Gold Cup favourite after a reappearance that just saw him fail by a length to give Knowhere 18lb at Aintree, a highly encouraging performance that was rated 170 by Timeform. For the fourth successive year, the Betfair Million is on offer. 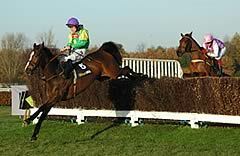 Kauto Star collected the bonus in the 2006/07 season. The Betfair Million bonus will be distributed as follows: £700,000 to the winning owner, £100,000 to the winning trainer, £100,000 to the winning jockey (s), with £33,333.33 for each leg ridden, and £100,000 to the winning stable staff. The going at Haydock Park is currently good to soft, good in places on the Chase and Fixed Brush Hurdle course and good, good to firm in places on the Traditional Hurdle and Bumper Course. Haydock Park’s Clerk of the Course Kirkland Tellwright commented: “The forecast for this week is for typical November weather. It should be overcast with the odd shower.